Authorities kept a tight vigil especially in the wake of saffron outfits raising the pitch over the sensitive Ram temple issue. Police on Wednesday arrested four activists of Hindu Samaj Party from Ram Janambhoomi police station area apprehending trouble from them at the disputed site on Thursday. So far eight persons have been taken into custody this week, including Mahant of Tapaswi Chawni temple - Paramhans Das, who had threatened to commit self-immolation for the construction of Ram temple on December 6. Though it has almost become customary for the two sides to come out with such announcements, the events in the run-up to the anniversary, especially the 'Dharam Sabha' (religious conclave) organised by the VHP on November 25 on the Ram temple issue, have prompted authorities to further shore up security in the city. Over 2,500 police personnel, besides Rapid Action Force and paramilitary CRPF, have been deployed as part of multi-layered security in Ayodhya including in and around the disputed site and several parts of Hanumangarhi area of the city, officials said. "We have heavy security deployment in the twin towns of Faizabad-Ayodhya. The civil police along with CRPF and RAF have been deployed on roads and sensitive localities," Superintendent of Police, Faizabad (city) Anil Singh said. "Checking of vehicles, hotels and dharmshala (rest houses) in Ayodhya is being conducted. We have made all necessary security arrangements and have allowed the only programme which are held by both the communities every year," he said. While Paramhans Das was arrested on Tuesday, Hindu leader Kamlesh Tiwari, who claimed to be a leader of Hindu Maha Sabha, was held on Monday. Tiwari had announced that he will perform Karsewa for the construction of Ram Janambhoomi on December 6. On same day Rangam Krishna Maharaj and Rajesh Mani Tripathi of - Naraini Sena was taken into custody over a planned protest. Despite the visible security presence, it was business as usual in the temple town as pilgrims moved in and around the Hanumangarhi area and most of the eateries and shops were open. "Ayodhya was peaceful during the recently held Dharam Sabha and is absolutely peaceful now," the Mayor of Ayodhya, Rishikesh Upadhyay, said. "Adequate security personnel have been deployed to ensure that no untoward incident takes place. Around 20-25 companies of police and Provisional Armed Constabulary (PAC) are permanently stationed at (Ram Janmabhoomi/Babri Mosque) the site and its vicinity," he said. The VHP spokesperson in Ayodhya, Sharad Sharma, said Hindu organisations are likely "to organise a number of religious programmes so that a grand temple of Lord Ram is built". "Special prayers for Goddess Saraswati (the goddess of learning) are to be held so that the people, especially politicians do not hinder the construction of a Ram temple, besides hawans seeking to get rid of all obstructions. "Tributes will also be paid to the innocent karsewaks who faced bullets and lost their lives," he said. Mahant Ramdas of Nirmohi Akhara said, "the day would be celebrated like Diwali and hawans would be held at Karsewakpuram". Meanwhile, state president of Indian Union Muslim League said, "We will observe this day as Black Day. Even the Supreme Court has termed the demolition of Babri Masjid as a matter of national shame". The Babri Masjid Action Committee has called on the people to observe the day peacefully and hold special prayers for early resolution of the dispute. Afaq Ahmad Khan, Chairman of BMAC, said, "We are waiting for the last 26 years for justice". He expressed the hope that the mosque will be rebuilt at the site. The BMAC said it will send memoranda to the Prime Minister and the Uttar Pradesh Chief Minister requesting them to ensure status quo at Ayodhya demolition site as per Supreme Court orders. "The anniversary should be observed peacefully like in previous years," BMAC convener Zafaryab Jilani said. "Those trying to vitiate the atmosphere and giving inflammatory speeches should be strictly dealt with. Security of all the residents of Ayodhya, especially Muslims, should be ensured and necessary action should be taken in this regard," he said, adding prayers should also be held for peace and harmony in the country. 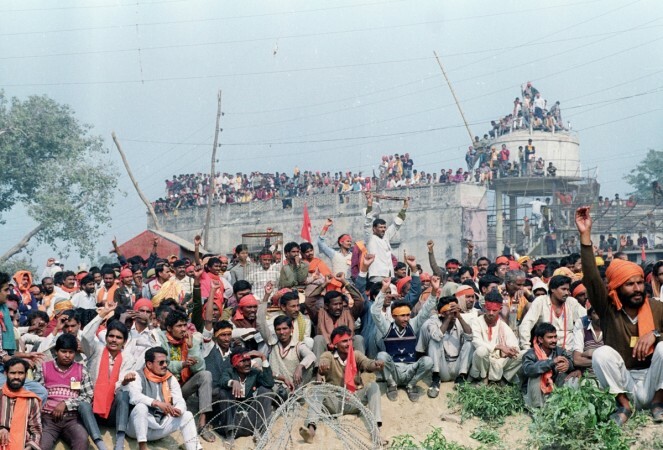 The Babri mosque was demolished on December 6, 1992, by 'karsevaks' who had converged as part of a movement by the BJP and Hindu outfits for Ram temple at the disputed site. The Ramjanmbhoomi/Babri Masjid title suit is pending in the apex court, which will decide the schedule of hearing in January. Fourteen appeals have been filed in the apex court against a high court judgment, delivered in four civil suits, that the 2.77 acre land be partitioned equally among three parties -- the Sunni Waqf Board, the Nirmohi Akhara and Ram Lalla.